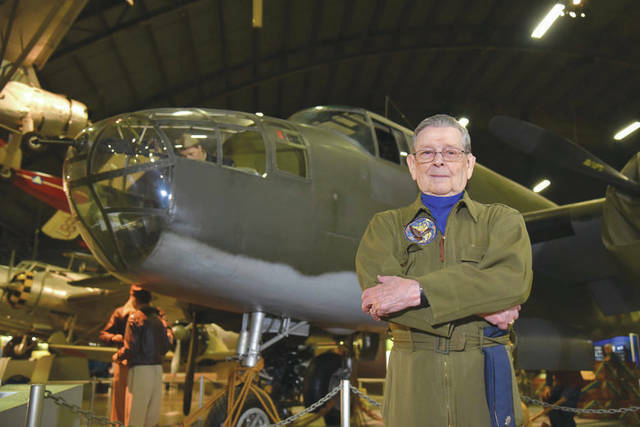 Submitted photo Former Air Force pilot Jack Hampshire poses for a photo in front of a North American B-25B Mitchell in the WWII Gallery at the National Museum of the U.S. Air Force. WRIGHT-PATTERSON AIR FORCE BASE — The National Museum of the United States Air Force will commemorate D-Day by offering visitors a special opportunity to interact with veterans who will be stationed at aircraft throughout the museum as part of the “Plane Talks” program 10:30 a.m. to 3:30 p.m. Wednesday, June 6. Among the veterans scheduled to attend are retired Air Force pilots Lt. Col. Jack Hampshire and Maj. Jack Kunz, who have flown aircraft such as the B-25 and C-47; retired Army paratrooper Maj. John Retterer, who will offer insight into the C-46; and Navy electrician mate EM3 Kirk Baylor, who will discuss his experience with the P-61. In addition, a civilian observer, Alexandra Moore, who lived in the coastal city of Portsmouth, England, (home of the Royal Navy) will discuss her first-hand experience of seeing the German Luftwaffe target her city in 1944. Former museum curator Joe Ventolo will speak about the B-24 exhibit. Before, during, and after D-Day, Allied aircraft destroyed important Nazi resources, helping to make the invasion possible. The German defenders put up a fierce fight, but the Allied troops gained ground and poured equipment and soldiers into France. During the next 11 months, the Allies on the ground and in the air freed France and other European nations from Nazi rule. At the same time, Russians pushed toward Berlin from the east. In early May 1945, the Allies, which included the Russians in the east and Americans, British, Canadians and others in the west, defeated Germany and the war in Europe was over. https://www.xeniagazette.com/wp-content/uploads/sites/32/2018/06/web1_180531-F-IO108-001.jpgSubmitted photo Former Air Force pilot Jack Hampshire poses for a photo in front of a North American B-25B Mitchell in the WWII Gallery at the National Museum of the U.S. Air Force.